So, you are now in the market for a summer scent? For summer, you may want something that smells fresh and energetic, perhaps slightly oceanic and slightly aromatic, something that shows your confidence, masculinity, and elegance. 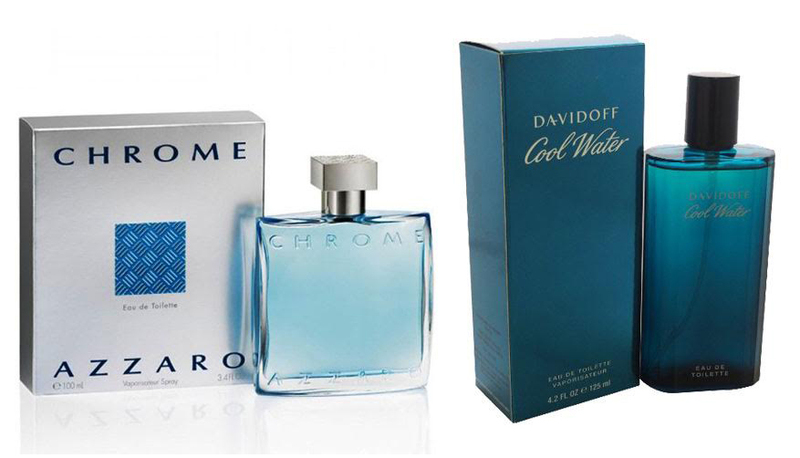 For summer, Azzaro Chrome and Cool Water by Davidoff are most probably your best choices. These two fragrances are masculine scents that are loved so much by their users. Azzaro Chrome is a rather new addition to the market, but it has quickly achieved an excellent reputation. On the other hand, Cool Water by Davidoff has been around for longer and has endured the test of time to showcase the quality. Which of them is better? To an untrained nose, these two fragrances may appear similar. However, the two are actually very different. The opening of Azzaro Chrome features slightly citrusy notes of lemon, bergamot, pineapple, rosemary, and neroli. The opening has some sort of a metallic note and smells a little bit alcoholic, but the whole is gentle and not offensive. On the other hand, Cool Water has a bolder, more pronounced opening that is sweet, minty, and fruity. The top notes consist of oceanic notes, lavender, mint, green notes, rosemary, calone, and coriander. The heart notes of Azzaro Chrome is fresh spicy with a touch of floral notes, featuring jasmine, cyclamen, coriander, and oakmoss. Cool Water has warmer heart notes of sandalwood, geranium, jasmine, and neroli. Finally, the base notes of Azzaro Chrome is woodier, with sandalwood, cedar, and Brazilian rosewood, whereas the base notes of Cool Water is more aromatic, featuring tobacco as the main attraction that is supported by musk, oakmoss, cedar, and amber. Both fragrances have moderate sillage and projection. They are not too heavy, and not too weak as well. More often than not, balancing the sillage can be tricky. If the sillage is too weak, nobody is going to smell you except yourself. However, if the sillage is too enormous, the scent can be intoxicating and nauseating. However, both Azzaro Chrome and Cool Water has managed to find the right balance. They can boost your presence without being too overpowering. Both are also long-lasting, though Azzaro Chrome is considered more long-lasting than Cool Water. Both fragrances are great. It comes down to your personal preference. If you like a citrusy, somewhat metallic opening that is gentle, then Azzaro Chrome can be your choice. Plus, it also has great longevity. However, if you prefer a sweet, minty scent, then Cool Water will do.